I love to combine patterned papers, but I always need a more "subdued" pattern as a base and that's when the "petite prints" collections come in handy! In this case I used a "tangerine" color from the "Boos & Brews Petite Print" assortment to mat the "Weird Science" (black) paper. The journaling was typed in Word first and then printed straight onto the tag. To get this done, I first printed the text on a normal white printing sheet, then adhered the tag on top of this with a bit of Scotch tape and fed it into the printer once again. 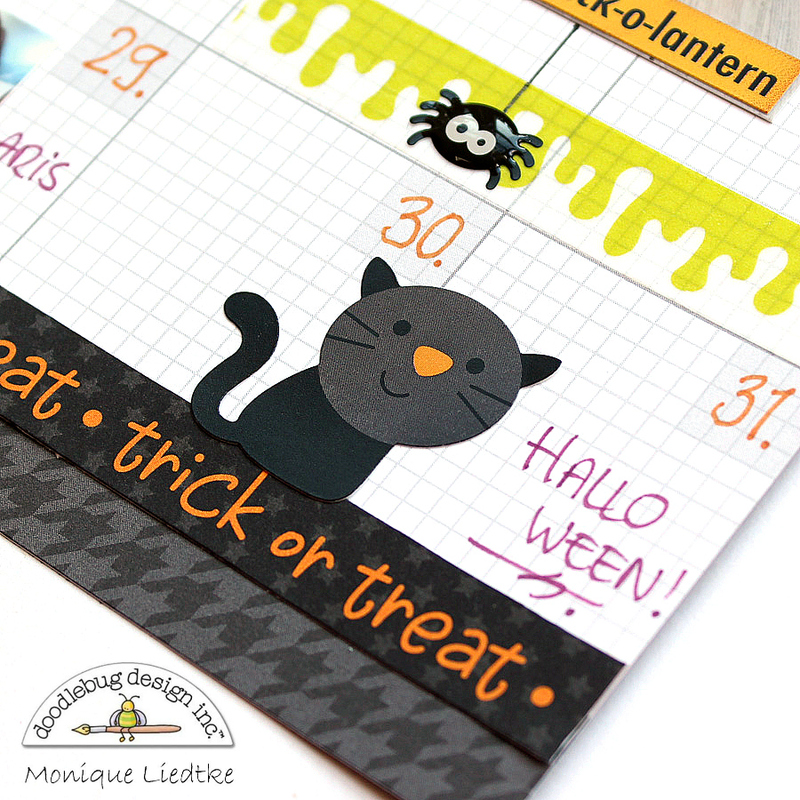 I adore the little Doodle-Pops like this little frog and the purple bat in the photo above. And how about the mad scientist die-cut from the Odds & Ends package?! Isn't he adorable!! 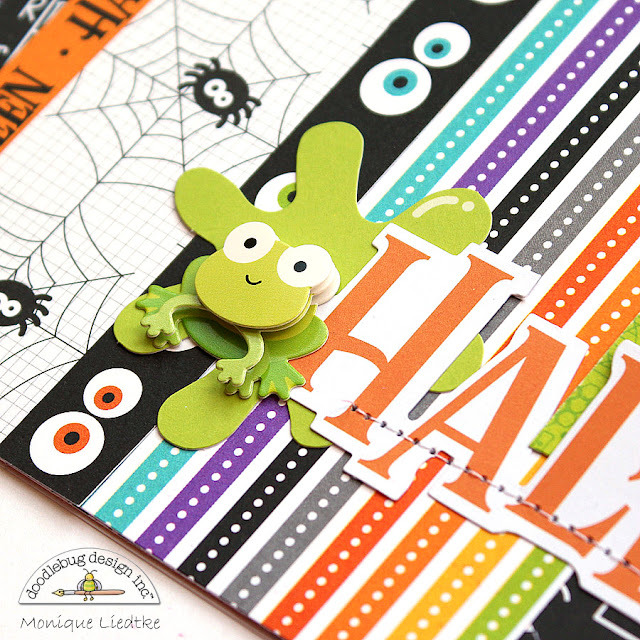 There are so many awesome embellishments in this collection, I could go on and on ... that spider Sprinkle for example, normally I don't like spiders but this one I love! 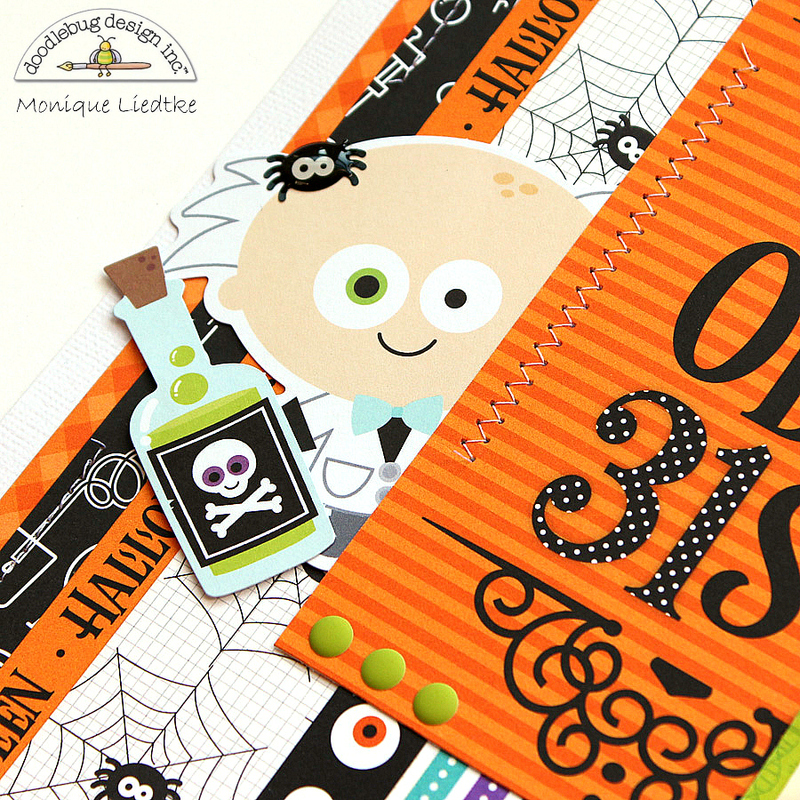 Supplies: Boos & Brews collection: Patterned Paper: Weird Science, Trick or Treat Stripe, Bubbling Brew; Die-Cuts: Odds & Ends; Sprinkles: Halloween Assortment Matte Sprinkles, Spooky Spiders, Eerie Eyes; Mini Doodle-Pops: Cute Critters; Labels & Tags; Petite Print Assortment. 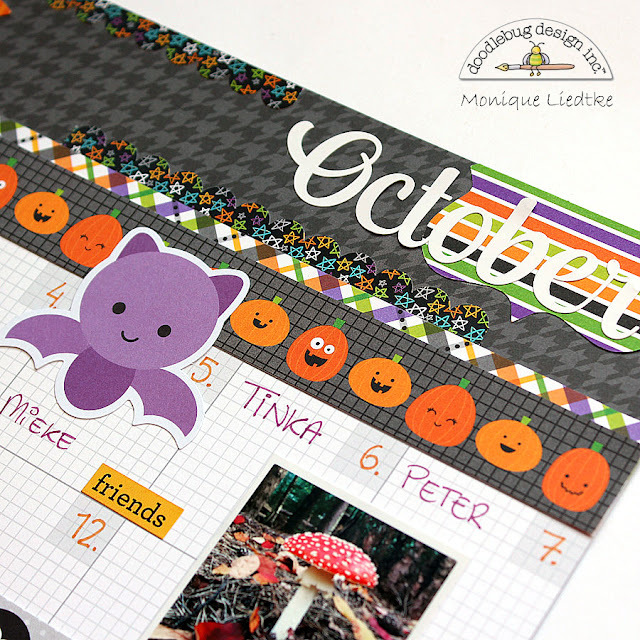 And because I desperately wanted to play more with this collection and everything was still lying on my table I decorated a new month for my birthday calendar, using the "Daily Doodles" collection: here's the October page! I printed a few photos to add to the page, but not too many as I wanted to use as many stickers, die-cuts, doodle-pops and sprinkles as possible!! One of my favorite die-cuts is this haunted house with all the eerie eyes! Have you seen the fun "eerie eyes" Sprinkles? I just love those!! 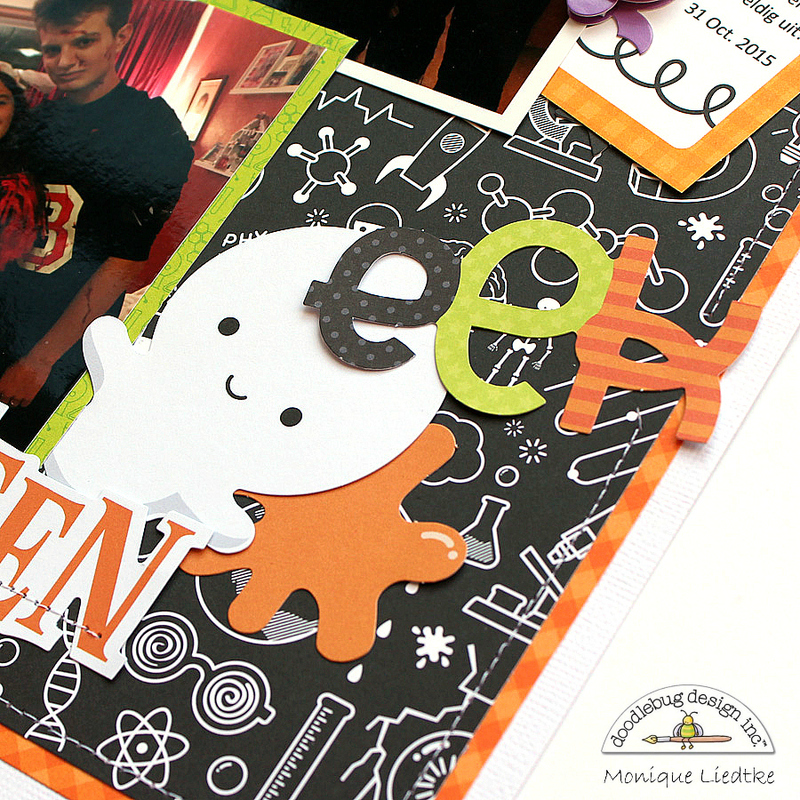 The little ghost looked cute with his "normal" eyes, but with the fun googly eyes he's even cuter! 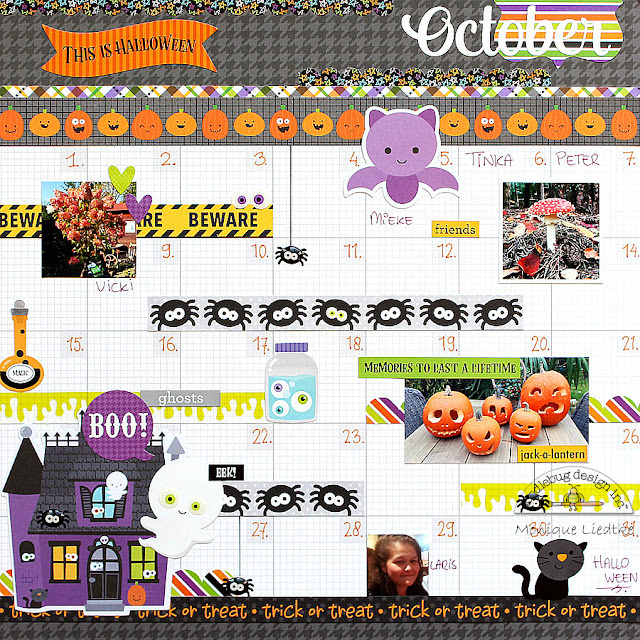 I always love Doodlebug's washi tapes and this collection contains five different tapes!! I think that my favorite is this one, the "radioactive" washi tape!! 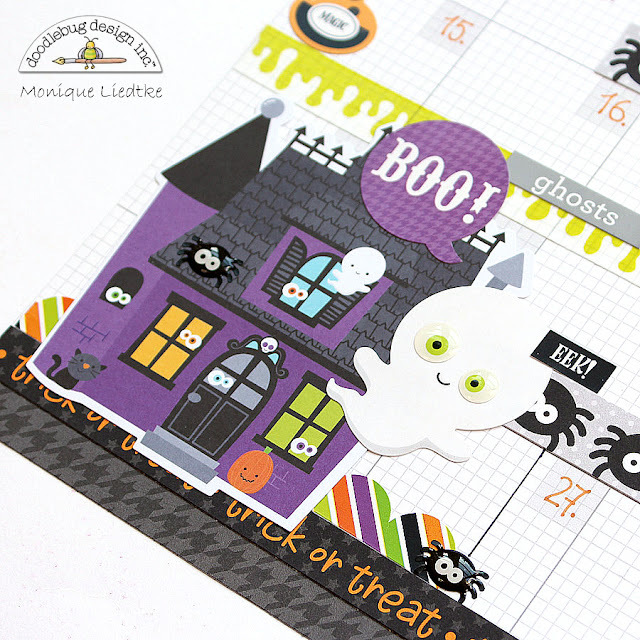 Supplies: Boos & Brews collection: Patterned Paper: Bubbling Brew, Daily Doodles; Die-Cuts: Odds & Ends; Washi Tape: Radioactive; Sprinkles: Halloween Assortment Matte Sprinkles, Spooky Spiders, Eerie Eyes; Stickers: Icons, This & That, Daily Doodles Lily White Months; Labels & Tags. I hope you enjoyed my projects, I had a lot of fun creating them! Thank you so much for stopping by our blog! Wishing you a wonderful and creative day! Wow Monique, this looks amazing!